Hey there! Still trying to get back to normal life in this house. Well, as normal as it can be when no one has to work and you live in a town where kids congregate outside the grocery store for fun.Needless to say... Today has involved sleeping in and a ton of Netflix watching. Last Tuesday when Hubby's parents were here, we left Rothenburg ob der Tauber early in the morning to start off a busy day. Day Two: Tuesday. Schloss Neuschwanstein and Dachau Concentration Camp. The day started off with us giants cramming into one of those awesomely tiny German cars for the 2.5 hour drive to the castle. 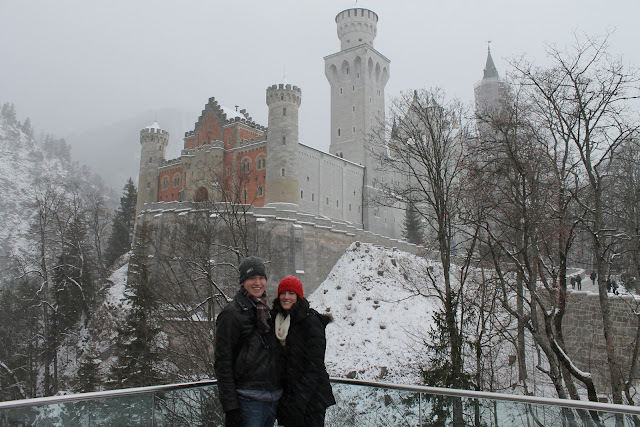 Neuschwanstein is in the mountains of Bavaria, minutes away from the Austrian border. Once we arrived and parked the car, we found a couple of things we weren't expecting - 1. 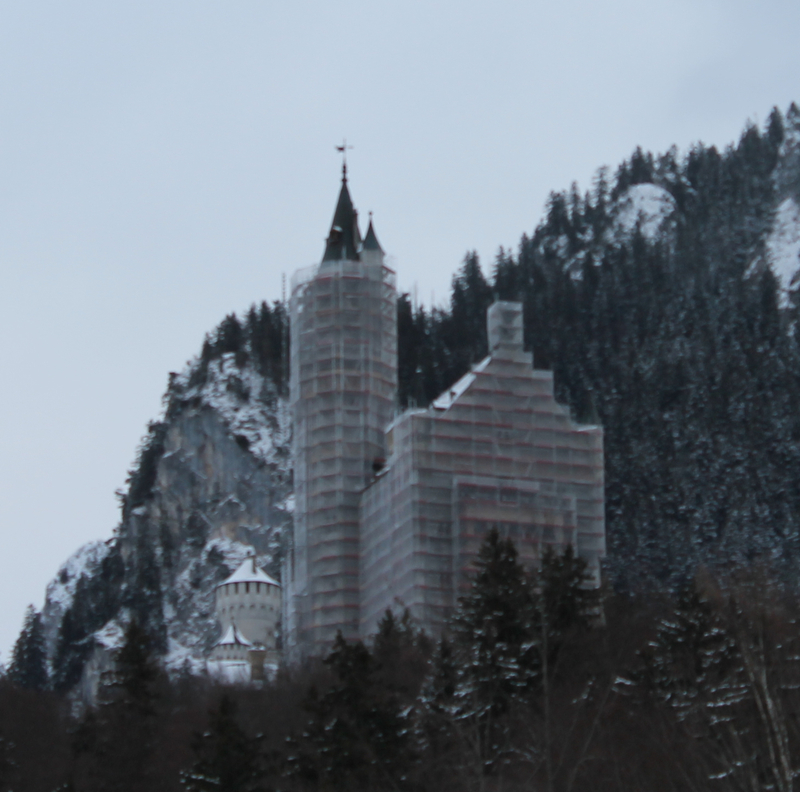 The side of the castle was covered in scaffolding (see picture), and 2. The castle didn't open until 10 a.m. (even though the website clearly stated 9:00 as the opening time). Since we were there an hour early and it was snowing like crazy, to kill a little bit of time (and keep our toes from freezing off), we went and ordered some hot cocoa, and Hubby's parents bought the tickets for the tour. Hubs and I opted not to go (I'd been there a few times and he doesn't care about the inside of castles, only the outside), so we hung out inside and waited for their tour to start before we hiked up the side of the mountain to take some awesome pictures of the castle. Fun fact: this is the castle that inspired Sleeping Beauty's castle. 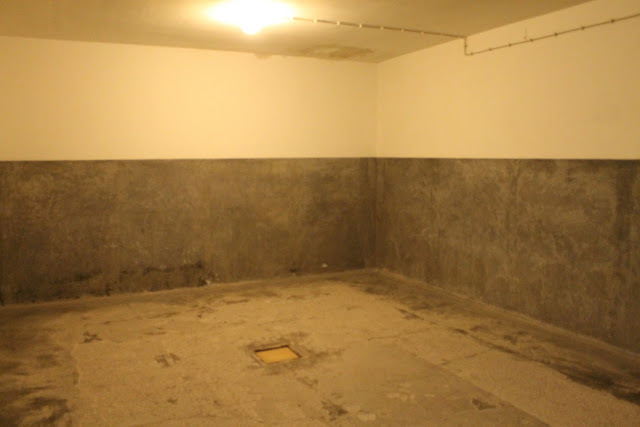 After the tour ended, we headed back to the car for the drive north to Dachau Concentration Camp. Obviously the atmosphere there was a bit different than that of a beautiful castle on a snowy hill. We arrived around nightfall, just as snow started to fall and the majority of people were leaving. 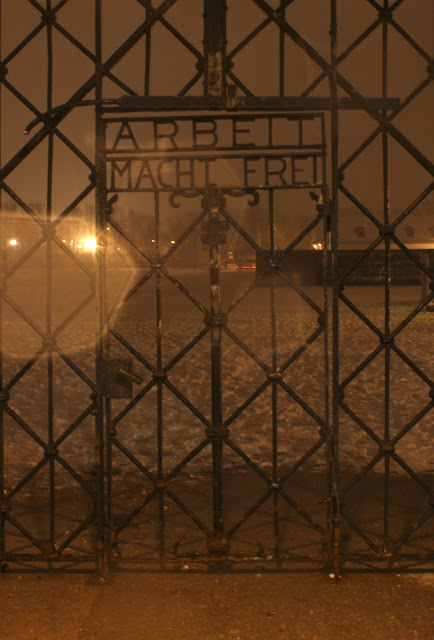 The mood was eery, and we all felt a bit somber as we walked through the gate that read "Arbeit macht frei" (work will set you free). We arrived at the crematorium with minutes to spare, and the guard was following us through, turning the lights off after us. Words cannot express the feeling as you walk through the rooms in which thousands of people were murdered without reason or cause. 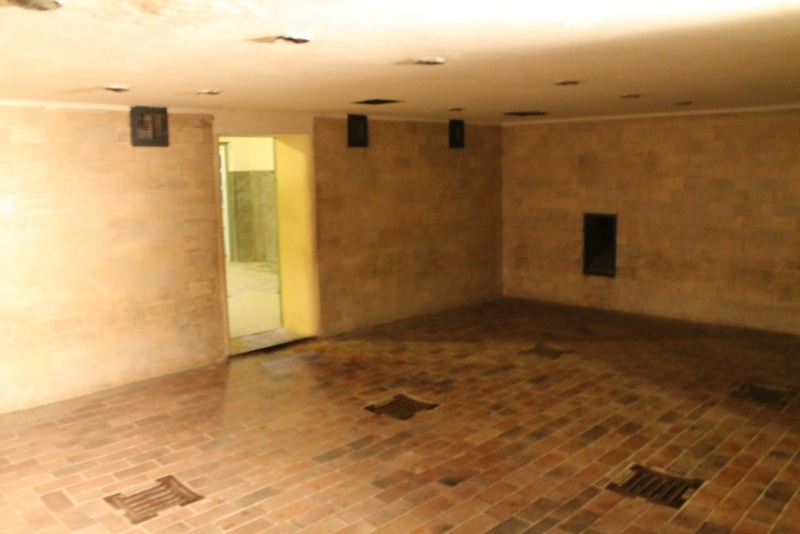 Room where the dead bodies were piled. 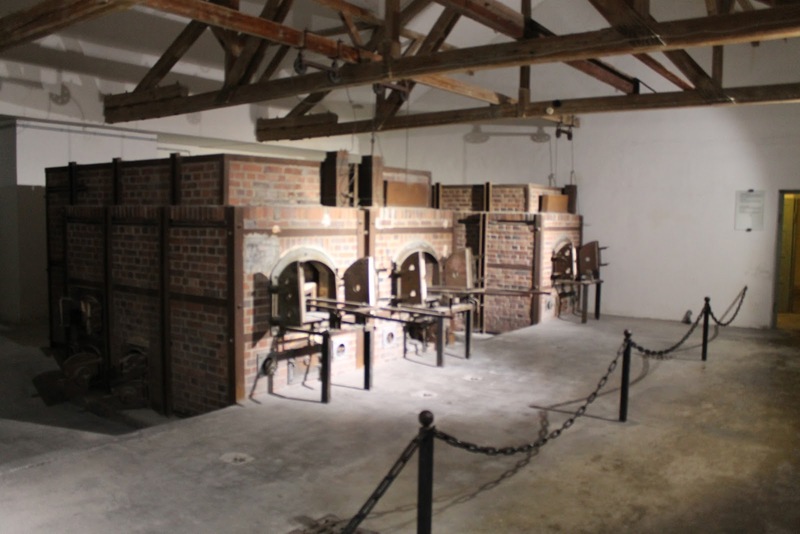 As soon as we left Dachau, we piled back into the car to head up to Nürnberg. Overall, Tuesday was a pretty good day. Happy morning, a little more serious in the evening, but we got a lot in. Stay tuned for Wednesday!!! Castle looks nice! And the other pictures are so sad. Also, I have never been more jealous of you than right now that you were able to tour a concentration camp. I've been a WW2/Holocaust freak since age 8. I know it's a weird thing to obsess over but I have and I have a goal of visiting all of the camps I can whenever we can afford to come to Europe. You are so incedibly lucky! 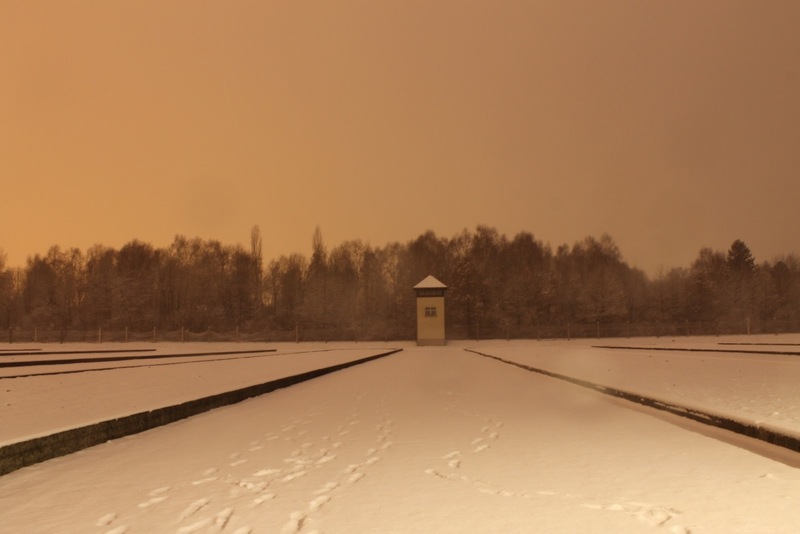 I feel that everyone needs to visit those places so we remember to NEVER let something like that happen ever again. i have always wanted to see a real castle. it's just so whimsical! you almost looked photo shopped in. so did you never get to go in because it opened an hour later?! Definitely a wierd combination! Both would be interesting to go visit. I just boo-hooed my way through The Boy In The Striped Pajamas. (The movie, not the book.) Have you seen it?? 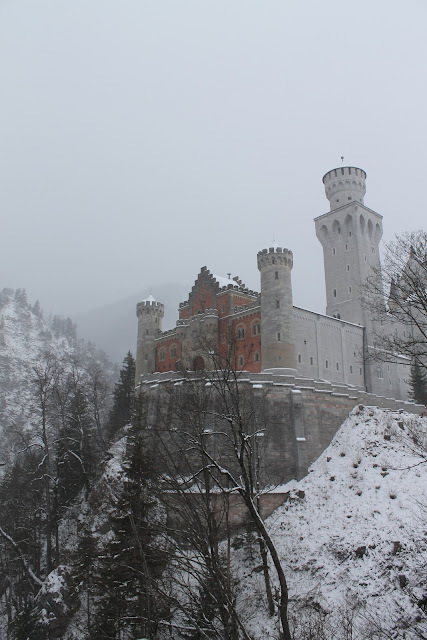 i've never seen neuschwanstein in the snow. i've always wanted to, though. sooo dreamy. visiting germany and more specifically a concentration camp is on my bucket list. i have such an appreciation for those who died and gave up everything they had for their religion. God bless them. As for the camp, I can well imagine what that felt like walking through it. There's a holocaust museum in Washington DC that I visited a few years ago. They gave us the name of a person who died and you carried the card with their name all the way through the museum. It was...words don't express. The empty trains left me feeling saddened beyond words and when I got the room with all the shoes piled high, I just broke down. 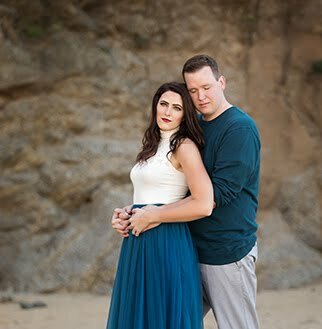 I started crying and my hubby just held me. I can't imagine the kind of evil it takes to commit such acts. It's important that we remember, that we never ever forget so that we never let it happen again.